Almost like water boots, [worn] in summertime. Summertime boots had no fur on them. There were no shoes or rubbers long ago. Even for summertime they sewed boots. This is a pair of waterproof summer boots designed for wet ground, rainy summer weather, and boating. The upper parts are made of scraped, winter-tanned seal hide. The seal skin was soaked in urine to remove oils and then bleached white through prolonged exposure to freezing cold air. The soles of these boots are made from the tough hide of a bearded seal. Theresa Nanouk: Rain boots, huh? Anna Etageak: Almost like water boots. Summer boots. No fur on them. There were no shoes or rubber boots long ago. Even for the summertime they sew boots. Theresa Nanouk: For walking where there are sometimes wet spots. Frances Charles: Kamitqiutik [short boots]. Summertime they wear them. Theresa Nanouk: Taimana iŋilgaan piliuguurut. Oscar Koutchak: They’re real light. My father used to use this kind up to here [top of thigh] in the summertime, when we were seining or fishing the river. He never used rubber boots. I never did see him use rubber boots. He only used [these] boots. These are pretty much waterproof. They swell up, when they get wet. These don’t leak if you take care of them. Bill Fitzhugh: Is that the right style for Unalakleet? Oscar Koutchak: Yes. And after they get real wet, they shrink. And you have to get a piece of hardwood and make it a shape like this [curved] on the top, then you can stretch them this way [along length of sole] inside. Make them longer and more pliable again, tasiuqłui [to stretch them]. These are nice. Kilugikpaqhami [real nice stitches]. Frances Charles: That’s seal skin. Anna Etageak: Utimaaqtuaq [skin without hair]. They take the fur off the sealskin to make it like that. Sometimes [they’re made] from reindeer skin. They let the hair come out. Soak them in the water. Aron Crowell: And the straps are just to make it tight around your foot? Art Ivanoff: Yes, just like a shoelace. Theresa Nanouk: So they won’t come off. Branson Tungiyan: These [straps] are for men’s style boots. For women’s boots, the laces wouldn’t be like this. Theresa Nanouk: They start from the back. Branson Tungiyan: You start from the back, both sides, and they go from the back to tie around. Frances Charles: The bottoms are ugruk [bearded seal] skin. Anna Etageak: Taimana nauŋ kamiliuqtuni tuŋnilignaqtut. Nassiq mitkukaŋaan kawiŋuaghaqłuu ilaatni tuŋniksriunaġaqtuq. Sometimes sealskin has fur and you just scrape it. Clean it off and dye them with willow roots. Make them red and use them for boot. Art Ivanoff: What kind of material is it? Frances Charles: That’s got to be sealskin. Theresa Nanouk: But they dye it with the willow, those alders. They soak them in water and dye them. Aron Crowell: And the soles are not dyed or anything, that’s just the natural color of the ugruk skins? Frances Charles: Inside the sole, we used grass. Theresa Nanouk: Inside of the boot, you put grass, like an insole. Theresa Nanouk: They don’t make soles out of seal flipper. They never make soles out of seal flipper. Oscar Koutchak: We eat them! [Laughter.] We eat the flipper. Branson Tungiyan: Did you guys bleach sealskin by aging them in urine to make them white? Oscar Koutchak: Quġvik guuq taamna immiqman qunŋit ammit soak-kaqtagait guuq. Frances Charles: Waagut utisiqsinaqłui igguqsinaqłui paniqsiguugiut. Oscar Koutchak: Qatiqsiqpaguurut nauŋ makua ukiumi. Anna Etageak: Katiquqhamitiin uqsrua sivuqaaqtuu stretch-aguugait. Kinisiqaaqłui imigmun taġiulingmun unaŋaqtamun imiqłui. Oscar Koutchak: To make skin real white, you soak them in sea water, and then you wring them when you think that’s enough. Anna Etageak: Soak them in the salt water and let it stay for so many days. And stretch them and hang them outdoors while it’s cold to make them white. To dry them white. Oscar Koutchak: The colder the better. Anna Etageak: Cold weather freezes them and makes them white. They use them for siŋiq [boot strap] like that. 1. This entry is combined with the discussion of boots incorrectly identified as E036194, which are the same type as E038771. 2. According to Frances Charles, tuŋniq [strip of skin] is a narrow strip of skin about a half inch wide that was used like bias tape [seam binding] on the seams of a boot sole [mukluks, waterproof boots, etc.] and boot upper [for waterproof boot] to make the seam waterproof. This is a pair of waterproof summer boots made from bleached seal skin, with bearded seal soles. 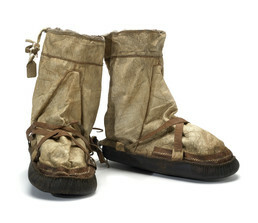 Iñupiaq women traditionally made a variety of boot styles, using materials and techniques that suited different seasons and conditions. (1) Some are still made today. Boot soles were tanned using two different processes. When only the hair was scraped off the sole was dark-colored, waterproof and durable, as on the pair pictured here. (4) This type of sole, with some bristles left on the outside surface, was also excellent for use on sea ice because it prevented slipping. For some boot bottoms, the epidermis (outer layer of skin) was removed. One type of summer boot, seen here, has a light-colored upper made from scraped, winter-tanned seal hide. The skins were soaked in urine to remove oils and then bleached white through prolonged exposure to cold air. (10) The seams on short boots were usually ornamented with alder-dyed strips of skin. This type of boot was worn in less wet conditions. (11) It has a drawstring at the top and straps for secure tightening to the foot.